Since 2000, Hotwire.com has been helping budget-savvy travelers explore the world without breaking the bank. Owned by the better-known Expedia, their services include flight, rental car, and package deals. But it’s hotel reservations that Hotwire specializes in. Their key feature is the Hidden Deals search, which allows users to nab rooms at often hundreds of dollars less than typical deals. The catch is that you can’t see which hotel you’re booking until you’ve paid. This allows hotels to get their free rooms booked quickly without competing with their booking posts elsewhere. You will see comparable hotels, a list of amenities, and the town the hotel in located in, and Hotwire only shows hotels that are four star and above. Thanks to the mobile app, travelers who tend to plan and leave on vacation at the last minute can still get great hotel deals along the way. If you are flexible on where you stay, and want to save some serious cash, Hotwire is a great choice. The Hidden Deals feature is the default search function of the website, but you can also switch to a regular search that allows you to see which hotels you are booking. You won’t get the same deep discounts as the Hidden Deal feature, but it will give you an idea of what sorts of hotels Hotwire partners with. You can also book flights at discounted rates, though not through the mobile app. On your phones or tablets, you’ll only be able to book hotels and keep up with your travel itinerary. There are plenty of package deals available through Hotwire, that include hotels and flights, as well as the ability to book rental cars separately. However, there is no focus on cruises, so anyone looking to hit the water would be better served by another travel website. Their search features aren’t as robust as other sites. They lack the ability to search for only first class or only coach seats on a flight, and the ability to search by hotel or rental company chain. For consumers who rely on their chain memberships, this is a problem. Hotwire does offer a unique feature for travel websites that many users find beneficial. They’ll offer discounted rates on local events, places of interest, and sights when you book your flight. This means that in addition to saving money on your travel and accommodations, you can keep costs down for entertainment as well. This is perfect for families who want a great summer vacation with a lot of options. You can’t book international flights on Hotwire; you’ll be redirected to a partner website, whose customer service and reliability may not reflect Hotwire’s. Hotwire.com has been helping budget-savvy travelers explore the world without breaking the bank with services that include flight, rental car, and package deals. 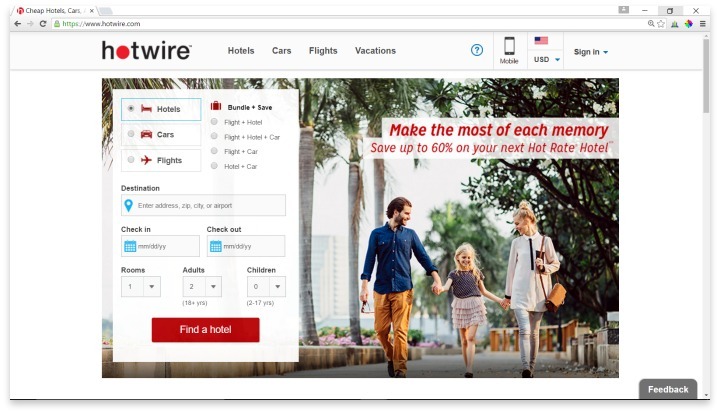 For the spontaneous traveler who needs to save money and isn’t hung up on specific hotel chains, Hotwire is one of the best websites out there. You’ll see plenty of customer reviews, amenities lists, and other items of import to help you make your decision without knowing the hotel’s name. While their focus is largely on accommodations, you can still get good deals on flights and rental cars as well, and the ability to get discounted tickets for local events makes Hotwire perfect for travelers who like to fly by the seat of their pants. Have you had an experience with this company? Please share your Hotwire reviews below.